One of the last places a person wants to find themselves is behind bars. However, every single day people are arrested and have to navigate the world of bail bonds, court hearings, and more. While we have given plenty of advice on this site about how you can obtain a bail bond with our help, we haven’t gone much into why bail bonds exist and where they come from. 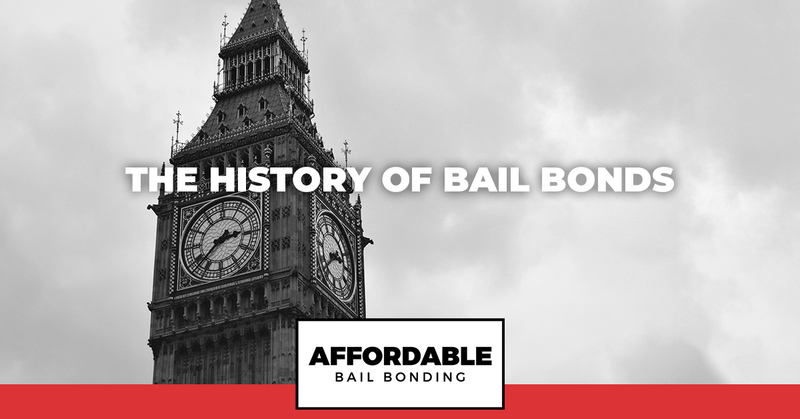 While you may not be particularly interested in this information while you are trying to find a bondsman to assist you with your bail, the history of bail bonds is very intriguing and you can learn about it in your free time by continuing to read below. A bail bond is a legal document that dates back to the 13th century. Just as it does today, a bail bond ensures that the prisoner or offender is going to attend his/her court date when it comes about. The history of this process can be traced all the way back to the thirteenth century. During this time in England, people would submit their property or money in exchange for a temporary release from jail. This practice is now extremely prevalent in today’s world with the process remaining relatively similar over the centuries but we will get into that more below. Why were Bail Bonds Created? The reason people began to practice the provision of bail bonds had to do with a lack of space to hold offenders as well as the number of prisoners who would flee immediately as soon as they had been granted temporary release. Before this system was put into place, only individuals who were wealthy were able to enjoy the freedom of being released from the prison, while the poor offenders had to stay in the prison for an unspecified amount of time until their trial. In order to remedy this, a group of entrepreneurs saw a business opportunity that they could not pass us. They realized that they can ask the jailed person to pay in some money and a percentage of the money submitted can be considered bail insurance and the rest can be kept to set the prisoner free. When this idea was presented, it was an enormous success and pleased every party involved and thus, the bail bonds system came into existence. Things started to become more formal in the year 1679 when the Habeas Corpus Act was first passed in England. This act gave judges the right to fix the bail amounts. Unfortunately, that did not work out the way it was intended to because judges began setting bail amounts that were way too high and impractical. This led to offenders not being able to afford their bond amounts, leaving the system right back where it was before bonds were offered. The solution to this problem would not come for another decade, however, when the English Bill of Rights was put into place. According to this bill, it was not necessary for excessive fines to be imposed on the offending individual. Another important occurrence in the history of bail bonds is the passing of the Judiciary Act of 1789 in the United States. This act stated that bail can be granted to any individual who committed a crime that was not punishable by the death penalty. If a criminal had committed a crime punishable by death (a capital crime), the act gave the judge the power to decide on their own whether bail should be offered or not. Two years after this act was put into place, the Bill of Rights came about. This bill stated that defendants are entitled to knowing what the nature of their crimes are so that they can demand bail is it is legally applicable. Unfortunately, even with the passing of all of these acts, there were still plenty of loopholes and drawbacks. One of these was that the federal government could still place heavy fines and cruel punishments to offenders. It was not until the Eighth Amendment was added to the US Constitution that it would be illegal for these types of acts to happen. It was 1988 when the passing of the Bail Reform Act occurred. This was the longest change that had taken place in the history of bail bonds since their initial conception. Before this act was passed defendants had to run the risk of being behind bars for several months before the price of their bail would drop. One very prominent figure in history who was locked behind bars for two whole months because of these exact reasons was the former Head of State, Lyndon Johnson. During the time Johnson was behind bars, he lost everything. His home, his car and his job were not waiting for him when he was finally able to get out of jail. These circumstances made it almost impossible for Johnson to get a job after he had been released. In fact, it took him four months to become employed again. Since the Bail Reform Act was passed, large fines were no longer imposed on people who committed non-capital crimes and the accessibility of bail bonds to all was possible. The only problem with this act was that there was one major loophole. The Bail Reform Act regrettably gave even dangerous offenders the option of being released on bail. It took twenty years but the remedy for this problem came when the New Bail of Law was introduced in 1984. This law replaced the Bail Reform Act and had much more specific regulations about what sorts of criminal could not post bail. This law also ensured that a bail hearing would be conducted for all offenders. As you can tell, the bail bond system has really come quite a way since the idea was first utilized. You are also fairly grateful that we have left behind the days when an arrest for a non-violent crime could land you in jail for months at a time. Today, there are thousands of independent bail bond companies that offer their services to people who have been arrested. Affordable Bail Bonding is one of these companies and we pride ourselves on being the company with the best service in all of Roanoke. We know how to get you out of jail fast! If you or someone you love has been arrested and you need to help of a professional bail bondsman, do not hesitate to call us at Affordable Bail Bonding. We would love to assist you right now! Speak With A Bail Bondsman Now!